You get about 8-10 chocs in. Worth it? No. Nothing special about these nowadays. The packaging does not say how many chocs and the box shows 4 types of choc. I decide to buy the £1 Thorntons box as it told you the chocs and qty in each box. I thought they were good as a little present for the kids teacher at Xmas. One of the few reasonable uses of this £1, 9ish chocolate box, as no doubt teachers get quite a few boxes and thus won't mind getting a small box from a small child. Or of course keep it for "personal use only"
Try giving it to anyone else, even as a token gesture, and I reckon they'll take it as an insult - negative value for your £1! One of the few reasonable uses of this £1, 9ish chocolate box, as no … One of the few reasonable uses of this £1, 9ish chocolate box, as no doubt teachers get quite a few boxes and thus won't mind getting a small box from a small child. Or of course keep it for "personal use only" ;)Try giving it to anyone else, even as a token gesture, and I reckon they'll take it as an insult - negative value for your £1! I am a mum of 6 and also a teacher within the early years sector and I feel this is a brilliant deal for teachers as already mentioned - I would be flattered that the children in my setting and their parents took the time to get me anything for xmas when I am infact doing the job I am paid to do , its absoluty the thought that counts and the gesture not wether they paid a pound or not for them. 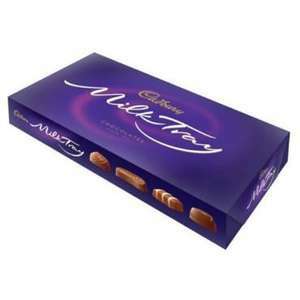 I once had a mum horrified that her child had half eaten the chocs that they had got me in the back of the car on the way to school - however the child said "I wanted to check Miss ....... would like them so I had to try them" even a half eaten box of £1 chocs meant more to me than anything. I think we all need to remember its about the thought and the gesture. I am a mum of 6 and also a teacher within the early years sector and I … I am a mum of 6 and also a teacher within the early years sector and I feel this is a brilliant deal for teachers as already mentioned - I would be flattered that the children in my setting and their parents took the time to get me anything for xmas when I am infact doing the job I am paid to do , its absoluty the thought that counts and the gesture not wether they paid a pound or not for them.I once had a mum horrified that her child had half eaten the chocs that they had got me in the back of the car on the way to school - however the child said "I wanted to check Miss ....... would like them so I had to try them" even a half eaten box of £1 chocs meant more to me than anything. I think we all need to remember its about the thought and the gesture. if its a gift, the receipent should be happy. no matter what the cost is. HEAT from me. these can be an "add on" gift which you can put in the gift bag alongside any other presents. Ideal for the wife with anniversary next week. Can anyone else remember the Milk Tray bars many years ago? I bet they were bigger than this! I hope it's a diamond anniversary, otherwise you're spoiling her :D.
Deal posting newbie! This is KathyDavies89 first deal post. Help out by leaving a posting tip or just to show your appreciation for their contribution.